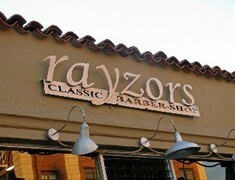 Rayzors Classic Barber Shop is the fruition of hard work and perseverance of one dedicated stylist Johnny Steinell. Our concept is uncomplicated- simplicity through design and consistency in service. In one word, classic. We take great pride in maintaining a business where you are assured a great service in a comfortable, unpretentious environment at a reasonable price. Take some time and explore our site. Get to know our staff and the services we offer. Come in and experience it for yourself. Wendy is here at 8am 7 days a week all other staff 10 am every day.